Finger Wheel exercise stimulates the tips of fingers and toes, influencing our emotion and mental balance and thus overall health (please read more on Feet, Hands, Spleen, and Emotion at the end of this page). Coupled with the movements of toes and fingertips, the heel lifting action brings your attention to the entire body for managing your balance. Additionally, the finger-arm circulating motion guides the sensory flow of your awareness along the vertical plane in the middle of the torso. 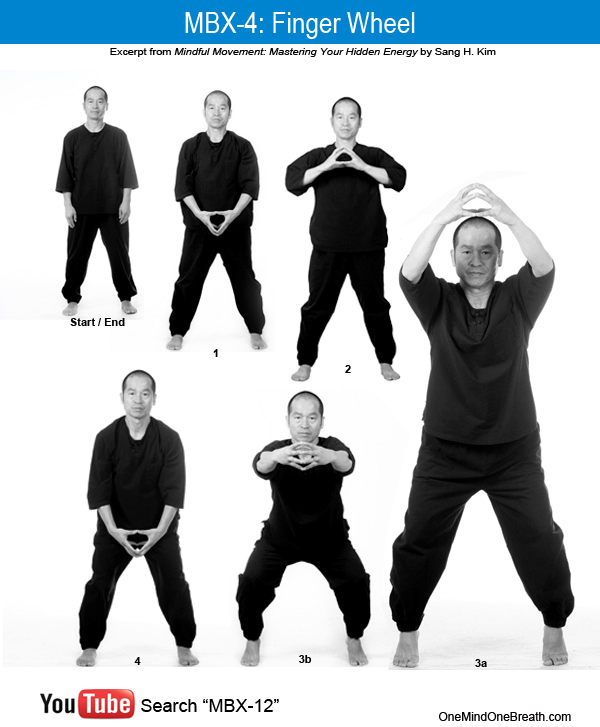 They improve your coordination and strength of the muscles and joints, which are necessary foundations for practicing MBX 7: Big Bow, MBX 10: Planting, and MBX 12: Unity postures. The heel lifting and finger-arm circulation skills also increase your proprioception, the feeling of where your limbs are without looking. 1. From natural stance with your toes pointed slightly outward, place your hands in front of the lower abdomen with your fingertips pressing against each other (1). 2. Inhaling quickly by pushing the belly out, raise your hands to chest level with elbows bent (2). 3. Exhaling, lift your heels briskly off the floor and roll your hands forward above your head (3a) in a circular motion; slowly lower hands to the chest level (3b) while bending your knees gently; and end in posture 4, completing exhalation. 4. Inhaling, return to natural stance. * For exhalation, initially breathe out sharply, then slow down commensurate to the speed of the fall of the hands, just like a feather falling. Our feet are essential parts of the body for a sense of physical balance. Our hands help us experience a sense of completeness in motion. We can hardly feel balanced when we step forward or backward without augmenting the foot motions with the swings of the arms, and vice versa. Their work in harmony is essential for experiencing a holistic sense of physical being. Our hands are somehow connected with our emotional life, expressing our thoughts. The hands of an angry person move agitatedly. The hands of a contented person move gracefully. In every culture, for thousands years, hands have been useful and intimate tools for accessing our emotions and bringing peace of mind in trouble. In praying for example, we put two hands together in front of our heart. In Eastern culture, a two hand bow symbolizes peace and harmony for everyone. Interestingly, from ancient time, the spleen has been associated with our emotional life, especially with temper and spite. When someone’s temper gets short, he or she may be called hot blooded. From olden days the spleen has been believed to be the seat of emotion, particularly worry. Worrying weakens the work of the spleen causing depletion of energy in other organs such as the liver and kidney and lungs, three central organs in the body through which blood passes and nutrients or oxygen are distributed. The spleen, essentially, is a checkpoint in which blood is cleansed and invaders and unhealthy blood cells are destroyed for the maintenance of optimal condition of the body. It regulates the immune system. That’s why the spleen is the target organ for regulating blood health and emotional imbalance in Eastern medicine. To sum, feet lifting and finger wheel exercises activate the energy channel linked to the spleen, which begins from the lower medial side of the big toenail and ends under the armpit linking the toes, the thighs, and the inner side of the torso. It may bring you back a sense of equilibrium after a long day’s stressful work. This entry was posted in MBX Project, MBX12, Mindful Movement and tagged Chi, Deep Breathing, Emotion, Equilibrium, Finger Wheel Posture, Inner Energy, MBX-4. Bookmark the permalink.